The lead round nose bullet is probably what most people think of when they hear the word “bullet.” These bullets are great for multipurpose use – they're usually cheaper than other styles, feed well in a wide variety of weapons, deform on impact, and are very accurate. You can’t really go wrong with an LRN bullet for any occasion, but they do have some limitations – the biggest being lead. Some places simply don’t allow it in any capacity, whether it’s related to the bullet left on the ground or the small amount of lead particles that enter the air when you fire them. Barrel leading is also another issue that the shooter should be aware of, but this can be addressed with a good cleaning. Lead Nose: Although it is a time-tested and proven material, lead and the potential for contamination is becoming a problem on some public land. One of the best features that is lost when a shift from lead is made is the loss of the weight of the lead. This creates an amazing ballistic coefficient, allowing it to cut through the air extremely well, especially with a round nose. The lead also deforms on impact – not as much as a hollow point, but enough to get a better wound than with an FMJ bullet. Lead is also simply easier to find, as you can pick up lead nose bullets almost everywhere. Round Nose: Naturally, the round nose offers more penetration than a flat nose, but less expansion than a hollow point. It’s a good middle-ground shape that’s very common for plinking and varmint control ammunition. Lead round nose bullets have the advantage of being commonly available and are made for many different uses. Most major manufacturers will offer at least one LRN ammo choice. Ideal for casual shooting, target shooting and training – the greatest advantage is that the LRN cartridge is usually at the more economical end of the price range. 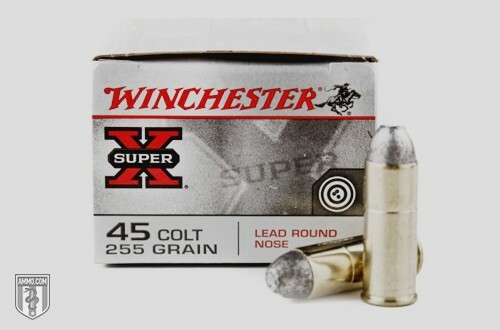 Several manufacturers offer LRN ammo, with Winchester and Federal being two of the most prominent manufacturers today. This ammo type is so popular, the main disadvantage is pretty much the lead. Some areas don’t allow it – whether it’s public land, shooting ranges or even entire states. You should always check regulations before taking lead ammo with you to prevent trouble and possible fines. The other main disadvantage with LRN ammo is that some lesser-known manufacturers don’t put much quality control into their bottom-tier LRN ammo. If you find a ton of it for next to nothing, be wary. It’s usually recommended to use a brand you trust and are familiar with, unless you’re using them for reloading purposes. Overall, this is a popular bullet style that’s found in all kinds of ammunition. It’s easy to find, fun to shoot and does its job nicely.